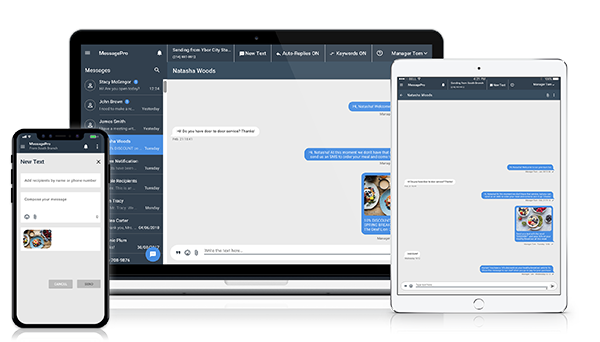 Communicate with your mobile and remote employees using texting from any PC, smartphone, or tablet thanks to MessagePro Office. You can also easily send (and receive) documents and pictures with our MMS service. Create different contact list to to quickly reach the people you need to contact. Additional features include logging, reporting, quick search and automatic replies. And it allows you to save money! Texting is increasingly the communications tool of choice in our company. Many employees only check email when they get home after work. Texting often results in immediate responses. It’s great to have logs of all text activity, but what really shines is the instant search of any message, making it easy to find the information we need to move forward. We use the MessagePro Fax solution less frequently, but, it saves a trip to the office, and it’s been a big time saver. And best of all—no more lost faxes or fax pages. Want to Know More About MessagePro for Field Service? Let’s Talk!